Subject: Re: help - heavy-duty inset hinges? help - heavy-duty inset hinges? blum tells me that their euro hardware will handle 7.5lbs per hinge, and they have no option for anything more. I've studied SOSS, tectus, and a few others, but all are for thicker doors. does anyone have a recommendation on how i handle this situation? for obvious reasons, i'm trying to avoid using exposed hardware. the kitchen is solid walnut, inset, raised panel... i think the knuckle of the piano hinge would be pretty ugly. any other ideas? Sugatsune just came out with a new heavy duty concealed hinge. It's big with no soft close. Dampeners would work though. You're probably have to pack out the insides for mounting it...don't think it comes in a face frame version. Also, pivot hinges would work. This is a very common application. The solution most often used is to simply add a sufficient number of hinges to meet the estimated weight of the door with a full storage rack attached. I don’t see the height of the doors on your drawing but would guess they are approximately 48” tall (Unless they extend to the floor). The doors with empty racks would be about 25-30lbs. These are fairly small pantry doors (about 18 X 48). I would wonder, could you even fit 60lbs of cans on a door this small? Standard or soft close Salice hinges are rated for 2 hinges/20lb door, 3 hinges/40lb door, 4hinges/60lb door. If you want added security, you could use 5 hinges. Place 2 close together near the top, 2 close together near the bottom and one in the center of the door. I would try to avoid using the inset hinge and plate combination where the mounting plate attaches to the back of the face frame. You will get far more stability by attaching the mounting plate directly to the cabinet side. 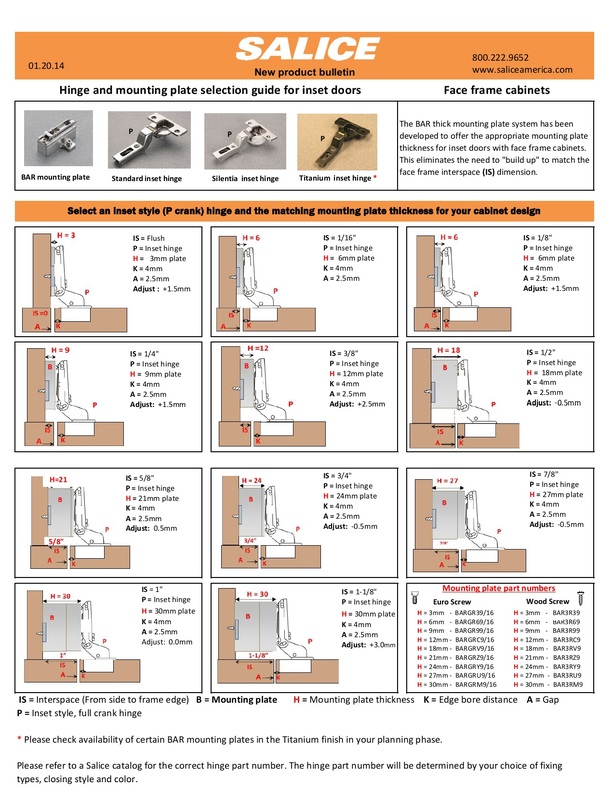 Below is a reference guide illustrating the correct hinge and plate combination to use when mounting to the cabinet side while considering the reveal that is behind the face frame. I hope I'm reading your drawing correctly. aha! well, alright then, i'll give them a try. i'm in the midwest, so perhaps you cover my region. richelieu in detroit is where i'll get the stuff.... unless you suggest elsewhere. thanks for everyone's assistance. Richelieu, Sterling Heights should have everything you need. Salice makes good stuff, We use their institutional hinges in our commercial work. Good hinges but for people that can't stand to see hinge knuckles not applicable. For light duty we use Blum clip hinges. Don't like face frame mounting plates. sounds great. i build my cabinets so that the inside of the face frame is flush with the inside of the box, so i don't have to worry about mounting the plates to the face frames or blocking out the box. i'll try these hinges and report back. I would take a more cautious approach. 100 lbs is a lot of weight for any hinge with an arm, especially given that it's an inset application. When I do inset I have a 3/32 margin around my doors, so think about this- if the door sags 3/64 you've lost half your margin and it will be obvious, and I'm sure you'll get a call from the customer if it's a high end kitchen. I have learned in the past that just because a client wants something, if it doesn't make sense or isn't structurally sound, you should discuss it with the client. If the client insists, make sure you price in the time it takes to properly engineer this. I would mock this up 1st with as many hinges as you deem necessary making sure you have the maximum weight on the mocked up door that you are representing and see if there is any sag. Your obligation is to offer a guaranteed result and anything less will only get you into trouble. One more thing to add. Remember these doors have to stand the test of time. Otherwise again, you will have problems. Any metal fatigue due to the weight will eventually cause a problem. If the Salice rep is willing to offer you a guaranteed result (and take care of any future service issues) then you're good to go. I would agree 100% with a trial mockup. This is always a wise and prudent activity, particularly if the application is unique or testing the limits of the specifications. After all, it is your name and reputation on the line and your customer is trusting you to make the appropriate choices of hardware. Any Salice product installed within the stated specifications is subject to a lifetime warranty set forth by the company in1989. If any doubt remains to the suitability of the product for the application, the Salice engineering team is always available for detailed consultation. Sugatsune does have heavy-duty inset euro cup hinges, but yes, they'd have to be blocked out for the face frame. Believe it or not, face frame cabinetry is pretty much a North American thing. The J95 hinges are fairly robust and can hold up to 88 lbs using 3 hinges. They come in free-swinging and self-closing types. There is currently no option for a soft close. Looking at David's image, a lot of that upper shelf space appears to be above 5'6" ~ 6'. 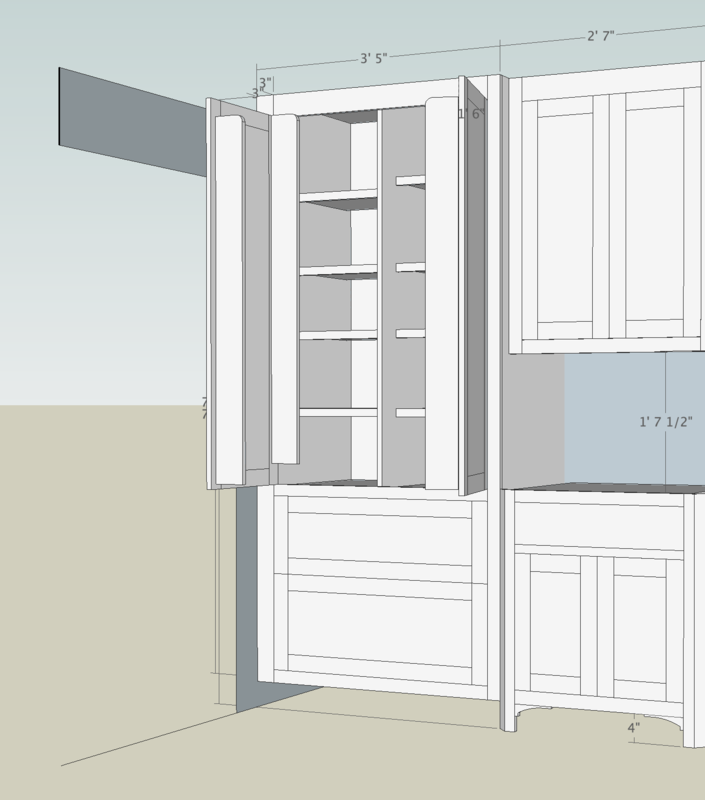 If you need to lower the weight, would it work for the client to eliminate the top 1-2 shelves? I find that they're not used as often as they're out of reach anyway, and you worry less about someone dropping a 2-lb can/jar of pasta sauce on their head.